Patna, the city which tracks back its history to around 490 BCE, the city which was an important point of attraction of the Magadh Empire. It had a very glorious past in terms of economy, business, education, diplomacy, democracy and authority. It has glorious past, and yet a very promising future. The city, until recently was home to the largest public Wi-Fi network of the world, covering around 21 kilometers’ area. 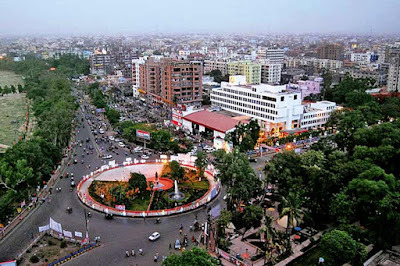 Geographically, it is the second largest city of eastern India. Infrastructure is one of the key factors that plays a very important role in the further development and is the proof of the development. Good connectivity ensures good investment and good market. The main source of income for the livelihood of the people and major contributor to the economy of the city is service sector and agriculture sector. The city has alluvial soil, which is the most fertile soil and hence produces large verity of crops. The agriculture sector is so large that it is called the agricultural hub of the region. Good connectivity from the remote towns and satellite areas ensures that the harvest from these areas come to the city’s market via trucks and tempos. The main crops include Rice, Wheat, Pulses, Sesame, Barley, Maize, Sugarcane, etc. The harvest is then processed in mills, therefore there are abundance of small scale and large scale mills like rice mills, sugar mills, etc. The products from these mills are then transported through the transport companies to other parts of the world. The flow of business is smooth. The authorities collect revenue for export of the product among different states, the exporter earns the actual profit from the trade and thus the money flows and strengthens the economy. In summers, production of fruits like Lychee and Mangoes goes sky high. The state is the largest producer of these fruits in India. The supreme quality products are exported overseas. The overseas revenue is seasonal but is huge. The rest of the produces are transported to the local and national market. Being the region’s business hub and the biggest market, all the harvest flows to the city’s market directly. Farmers get good price of their crops in this market. With the green revolution, the schemes of government and better availability of resource, encouraged the farmers for the agricultural work. Following the recent steps in digitization, the making of services online for the farmers and issuing the credit card for farmers ‘Kisan Credit Card’, the role of middle men is cut. The benefits are now directly transferred from the government to the farmers. In the case of drought or famine, the insurance of the harvest is also covered by the government. In case of less rain, the presence of canals, and rationing the water according to the area of the crops make sure that the water is available for the farmers. These types of schemes let farmers do the agricultural works without any fear of rain and get the profit directly. Although the collective per capita income of the entire state of Bihar is much lower than the national average, but the per capita income of Patna alone is higher than the national average. This depicts the selective development of the city, and neglecting the other regions. This should be looked by the authorities and should be taken care of. Patna is listed as 21st fastest growing city in the world. The recent investments and setting up capital funds are the factors that are yielding this result. According to World Bank Report, as of 2009, Patna is best city in India for startup. This encouraged the IT and non-IT startups to set up their foot and start doing business with ease, in the city. The government now just need to ensure safety and safeguard the investment to stop the migration of the companies. The Patna Master Plan, is a blue print of the better infrastructure in the coming years. New airports, good roads and highways, and allocation of block of land to develop IT Park are the key points of the master plan. Developing the IT Park will open new gates of opportunity for the city in the changing times. The digital sector and e-commerce sectors needs good infrastructure to setup. Giving good environment and ambience to the IT and ITES sector, will encourage their participation in the market and will strengthen the economy. The presence of IT companies will also throttle the migration of the tech people, going to towns like Bangalore and Hyderabad in search of jobs due to lack of IT market in their own hometown. It will even attract people from other places to come and settle here for the jobs. Presence of institution like Reserve Bank of India, and other establishments like this, employs people in the service sectors which one of the major sectors of the city’s economy. The city is home to regional headquarters of many banks and financial institutions, as well as educational institutions like Central Board of Secondary Education. Tourism is also a major source of income and revenue generation. Many landmarks in the city and state attracts tourists from around the world. Even for the destination not exactly located in the city, the tourists have to go via Patna, due the presence of Airports and Railway stations. The recent occasion and celebration of 350th Prakash Parv, was a great success and lifted the reputation of city. It attracted tourist not only from the national nut international level. The authorities invested smartly and got appreciation from all over the world. If such occasions will continue in future, it will encourage more tourists and ensure the source of income for the people. For info on online truck and freight booking, go to Goods On Move. There you can book all the services online, and get the business done without any hassle, at an instant. Calculating freight rates, booking lorries, truck, tracking shipment online, etc., all can be done with some clicks. As the name suggests, the goods will be on move, instantly. No Comment to " Patna - Industrial Development Post Independence "